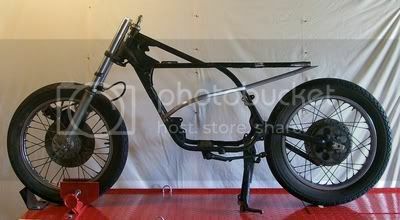 Re: DWMS Racing RD350 Bare Frame Custom Build! Brother Joe, I've seen what you can do with an engine and I look forward to seeing what you transform my jewel here into! I spoke with my painter today and we have some pretty "trick" ideas for the tins...... This little RD is going to be something special! I love building engines and making them pretty Brother so I am really looking forward to completing the engine as well! It is awesome to hear that you spoke with your painter and I can not wait to hear all of the final details, she truly is very special! 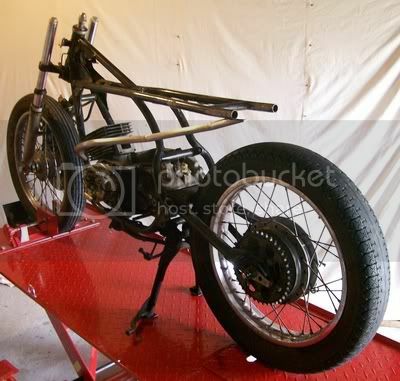 We have been talking about a couple of different ideas for the frame work however we are not sure which way we are going to build it yet so I am currently working on the engine, I will add some new photos for you tomorrow Brother! It is good to have you here with us Brother! 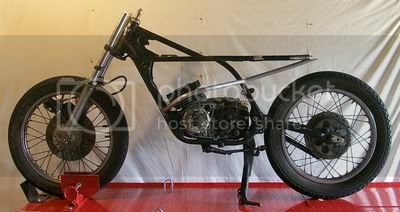 Re: DWMS Racing RD350 Build! 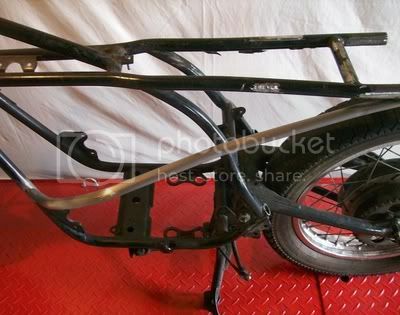 New Custom Frame Work Photos! Brothers I apologize for the delay in adding new information to this thread, we had a couple of different ideas for the frame work and I was waiting for approval of one of the designs. 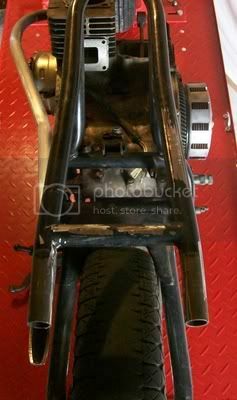 I have had an idea for some frame work that I have been wanting to do for a while and Brother Bluesmokey approved the design that I had hoped he would over the weekend so I started working on the frame some more today! I had to leave the bottom end of the engine together while I was waiting to see which design we were going with as I needed to have the engine in place for measurements and to make sure that we had enough clearance to install and remove it if we went with this one particular design! We decided to run a one piece frame rail from the front down tubes, around the cylinders, and all the way back to the rear shock location on each side of the frame! I set the bottom end of the engine back in the frame and bent the left frame tube and then built a matching frame tube for the right side. I designed the new frame rail so that it does not touch the rear frame down tube and is about an inch away from it so that I can add two short pieces of tubing to form a triangle connection there. 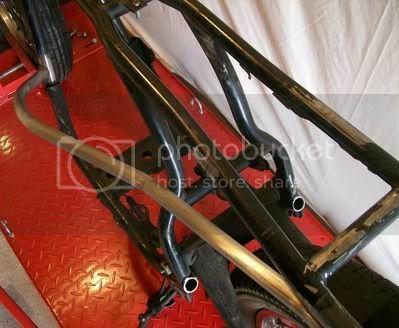 I am also going to extend the rear of the top frame tubes and once I have I will box in the rear triangle of the new frame section to incorporate the new shock mounts. It is hard to get good photos that truly show the new dimensions that this frame design adds however I took a few to share with you all! This may sound like a silly question, but how will you get the motor in? Otherwise, I really dig the outside of the box thinking you have going on there. Brother the engine goes in or out of the frame easily without the heads or cylinders on so I will install the completely built bottom end and then assemble the cylinders and heads inside the frame. So cool Joe! Bolt-on frame sections could alleviate Justin's concern as well, but it sounds like your plan is better. I like it a lot. It will be interesting to see how it improves the chassis. I think it should? 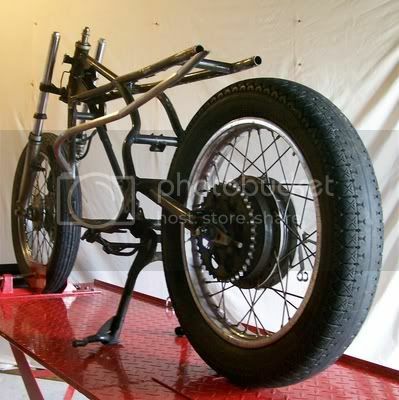 A stiffer frame cannot hurt and overall weight shouldn't be a penalty with so much other weight reduction. It could turn out to be a half cradle and half trellis? Brother I am getting ready to rebuild the engine so I removed the studs, they did not have to come out I just wanted to clean them. You know I like to take my engine builds all the way down to the bare cases! As far as installing new rings or pistons they would not have to come out then either as the heads and cylinders will clear with the engine in the frame and this frame modification does not change that at all so I am not sure what you mean or what it is that you do not get? So top end gaskets and stud replacement every time the motor comes out?